Two great Jesuit churches stand near each other in Rome. 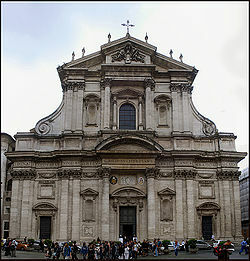 One is the Church of St. Ignatius and the other the Church of Gesu (Jesus). Both are imposing and majestic and reflect the glory of the Jesuits in their heyday. The one to the left is called the Church of St. Ignatius Loyola. 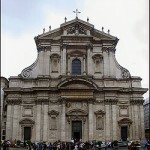 In Italian it is Chiesa di Sant’Ignazio di Loyola a Campo Marzio. It was built in the 17th century, back when the Jesuits knew who they were and what their commission and charism was (though there are still a few like that today, e.g., Fr. Joseph Fessio and Fr. Mitch Pacwa and the deceased Fr. John Hardon). Beneath him is Martin Luther with a closed Bible. St. Ignatius has his foot on Luther’s neck and Luther is biting the back of his own hand. Click IMG_3603 for a short video clip. This would probably not go over very well today. 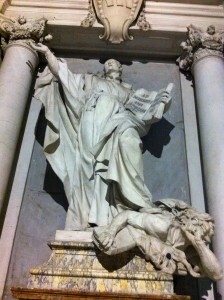 In fact the sign under the statue only says “A Statue of St. Ignatius of Loyola” but fails to explain the original purpose and meaning of the statue and who is under St. Ignatius’ foot. 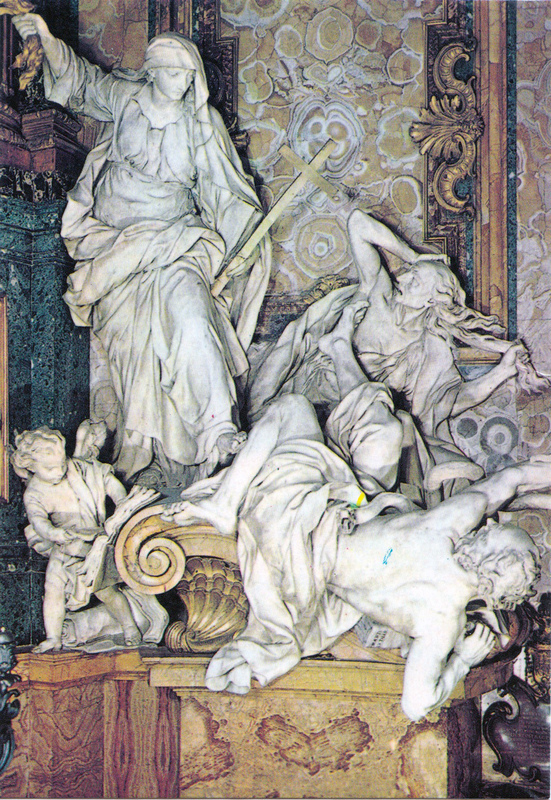 I bought their booklet explaining all the statues and art in the church and it fails to show this statue or to explain it. It is fully recognized that we are in a new era today, and do not attack today’s Protestants for the schism caused by Luther and we refer to them as our “separated brethren.” However, the things taught by Protestants that are contrary to the teaching of the Church are still heresies and their separation from the Catholic Church and the Roman Pontiff is still an unfortunate schism. But we still need to realize that when the “Reformation” took place the rebels were heretics and caused a schism in the Church and the saints and theologians did not hesitate to say so. We need to quit being politically correct and overly ecumenically sensitive and start calling heresy heresy and schism schism when they raise their ugly heads up in our current time. In the Church of Gesus is another of my favorite statues. It is called The Triumph of Faith over Heresy and was designed during the Protestant Reformation and the Catholic Counter-Reformation. Heresy was not considered a naughty word back in the day when battles were fought for the truth of the Catholic faith. It is a word that should maybe be resurrected in our time. To the right of the altar sits Pietro Le Gros’ sculpture entitled The Triumph of Faith over Heresy. This sculpture depicts Mary casting Martin Luther and his precursor, Jan Huss, out of heaven. An attendant angel (lower left) rips their translations of the Bible and their writings to shreds. The militant nature of the Jesuits and their mission to spread the faith and reassert the power of the church is clear in this dramatic work. A companion sculpture entitled The Triumph of Faith over Idolatry” by Jean-Baptiste Theodon further cements the message of the Jesuits.